At the 2016 AGM, George Prodanou proposed that we name the laneways in the neighbourhood in commemoration of the 50th anniversary of the Republic of Rathnelly – a proposal that was unanimously accepted by all in attendance. After polling the community for suggestions, two naming schemes emerged: “The Artists” and “The History”. You can see details about the two naming schemes here. We put the two naming schemes to a vote, reaching out to 250 households in the Republic to ensure everyone had a chance to have their say. With 94 people weighing in, there were 41 votes for “The Artists” and 53 votes for “The History”. Following logistical negotiations with City of Toronto staff (and the realization that one of the lane names in “The History” scheme was already taken elsewhere in the City! ), we landed on a set of five lane names that bring together elements of both “The History” and “The Artists”. The Republic of Rathnelly is now home to (A) Robin Fraser Lane, (B) Rebellion Lane, (C) Michael Snow Lane, (D) Stop Spadina Lane, and (E) Aileen Robertson Lane. Robin Fraser was one of the founders of RARA, authored our constitution, and spent 40 years of his life defending the Republic against unwanted development. Living most of his life at 31 Rathnelly, the Republic would not be what it is today without him. Robin passed away in January 2018. You can read his obituary here. 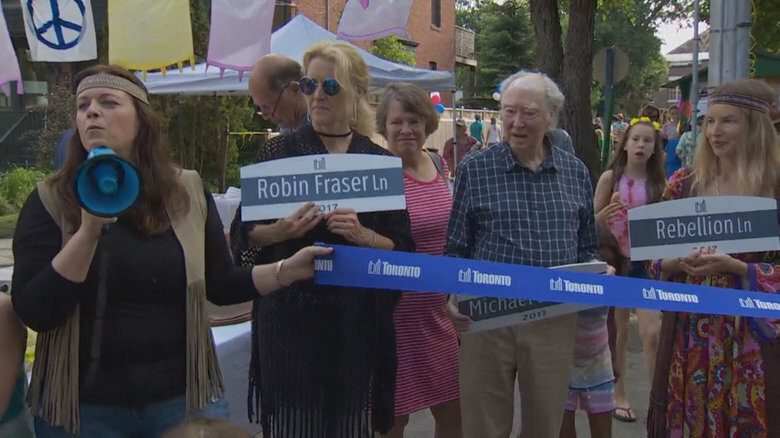 Rebellion Lane commemorates how Rathnelly residents cheekily declared independence during the 1967 Centennial celebrations and came together to protest and bring attention to the impact of building expressways into the heart of Toronto neighbourhoods. Michael Snow has lived for many years at 176 Cottingham Street with his wife Peggy Gale. An artist known across Canada and internationally as a painter, sculptor, filmmaker, and author, his work hangs in the National Gallery of Canada, the AGO, the MoMA, the Montreal Musée des Beaux Arts, and the Vancouver Art Gallery. Stop Spadina Lane recalls the Spadina Expressway and Crosstown Expressway, which, had they been built, would have turned the Republic of Rathnelly into an off-ramp. 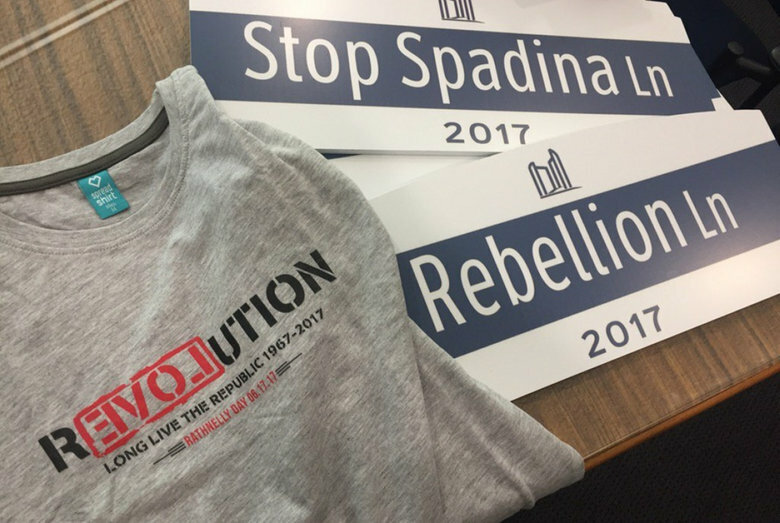 Narrowly escaping approvals, protest by citizens in Rathnelly and across the city proved collective civic action works. Aileen Robertson lived on Rathnelly Avenue from 1924 to 1986. She was crowned Queen Aileen the First in 1967 and until her death at nearly 100, she presided over each biannual Rathnelly Day with dignity and an immense sense of humour. RARA would like to thank George Prodanou for coming up with the idea to name the five lanes in our neighbourhood and to thank Pym Buitenhuis for working closely with George, the city engineering department, our city councillor, and Ben Unsworth, who kindly set up the online data collection for the vote. 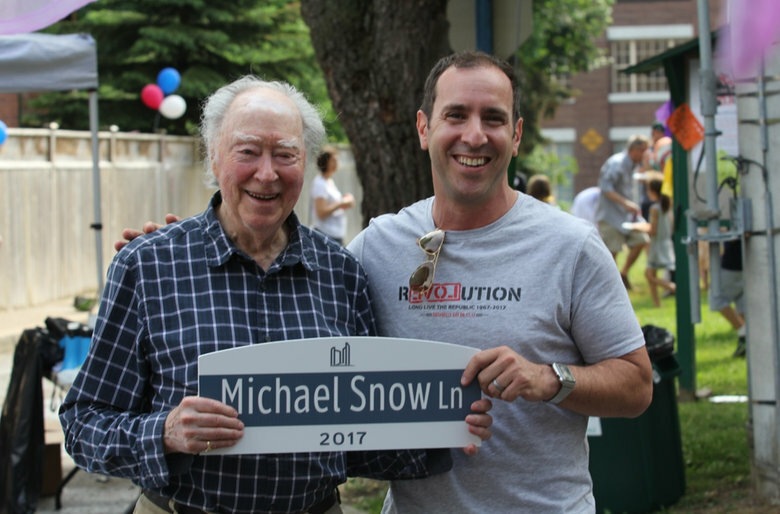 We would also like to thank Michael Snow and Robin Fraser for being such remarkable individuals and for graciously accepting to have the lanes named after them. And finally, thank you to everyone who voted! It was a lively debate that close to 100 residents of the Republic weighed in on and we are exceptionally pleased with the results.